The living rooms of today have come a long way since the days of old. Gone are the sitting parlors full of rigid furniture where people simply perched for conversation. Gone as well are the plastic slipcovers your grandmother put over her favorite furnishings. Today’s living spaces are expected to be as active, stylish, durable, and attractive as the every other room in the house. One of the easiest ways to achieve a durable living space in your home – whether it is a den, playroom, family or dining room – is to select fabrics that can keep up with active lifestyles. Sunbrella performance fabrics are made to withstand the trials of everyday life and carry a five year warranty, making them ideal for the Perspective New England Beach House and the Hall family. Interior designer Kate Jackson knows that using such a fabric will ensure the rooms look as beautiful several years down the road as they did the day she finished decorating. With countless beautiful fabric options to work with, Sunbrella fabrics are great for custom interior projects. If new furniture isn’t in the budget right now, or you really like the shape of your current sofa or dining room chairs, consider using custom slipcovers to extend the life of these pieces. 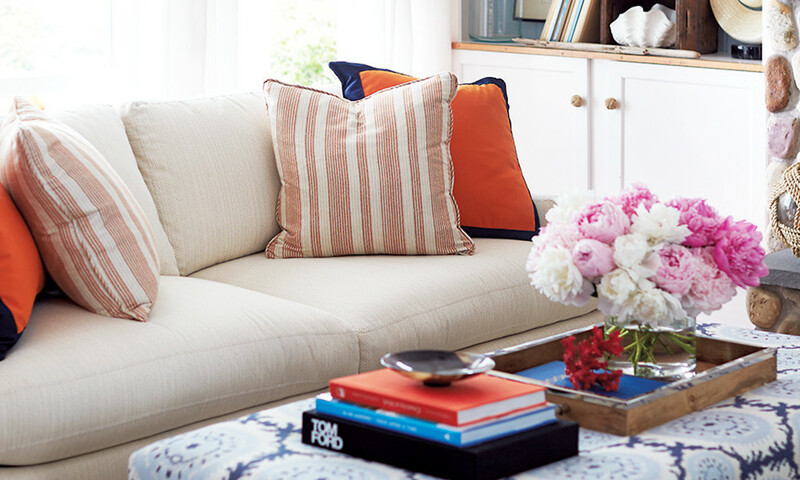 Using a fabric such as Sunbrella will help your slipcovers repel stains and resist fading, two common upholstery problems. In the same vain, use pillow covers that unzip so you can easily wash them as needed. Consider creating multiple pillow covers from Sunbrella fabric that you can change out with the season. Variety is the spice of life, right? If the function of your living space is truly for living – watching movies, every day dining, kids playing, toys in every nook and cranny – it’s best to invest in high quality, sturdy furniture that can stand the test of time. While antiques can add a unique decorative flair, they simply aren’t practical for many living spaces. If you are absolutely in love with an antique piece or have a family heirloom you can’t part with, make sure you place it where it won’t be damaged or sustain everyday use. One of the keys to having a living space that lasts is making sure there is adequate storage for items like books, games and toys, eliminating the possibility of tripping and helping to keep the space neat and tidy. One of our favorite storage pieces in the Perspective New England Beach House is a set of Sunbrella baskets from Colonial Mills that hold toys and shoes, keeping the foyer and the third floor girls’ room free of clutter. Other functional storage pieces include an upholstered ottoman in Sunbrella fabrics that opens to reveal space for DVDs, games, magazines and more. Bookcases provide the ultimate storage solution and can be styled with elegant décor similar to what designer Kate Jackson did in the Beach House. One of the fastest ways for a room to show wear and tear is through worn out, faded draperies. Often considered an afterthought, draperies can change the way a room is framed by the use of fabrics in contrasting colors, luxurious textures and details. Selecting high quality, durable, fade-resistant fabrics for your draperies is as important as selecting them for the rest of your furniture. Sunbrella upholstery fabrics are ideal for window treatments and won’t fade in the sun. Add a layer of romantic sheers as Kate Jackson did in the Beach House and diffuse the light. What does creating durable living spaces mean to you? Leave your comments and ideas below.